Door lock and unlock switch Input lock or unlock signal to BCM. Door lock actuator Output lock/unlock signal from BCM and locks/unlocks each door. Door switch Input door open/close condition to BCM. Key switch Input key switch condition to BCM. Front door lock key cylinder switch LH Input lock or unlock signal to the BCM. ABS actuator and electric unit (control unit) Transmits vehicle speed signal to CAN communication line. Ignition switch Input ignition switch ON/OFF condition to BCM. BCM Controls the door lock function. Remote keyless entry receiver Receives lock/unlock signal from the keyfob, and then transmits to BCM. Key switch Input key switch ON/OFF condition to BCM. Horn Provides audible warning in panic mode. BCM Controls the trunk lid opener system. Trunk lid opener actuator Releases the mechanical latch to open the trunk lid. Trunk lid opener switch Inputs the trunk open request to the BCM. Trunk room lamp switch Inputs the trunk lid open/close condition to the BCM. The door lock and unlock switch (driver side) is built into power window main switch. The door lock and unlock switch (passenger side) is on door trim. Interlocked with the locking operation of door lock and unlock switch, door lock actuators of all doors are locked. Interlocked with the unlocking operation of door lock and unlock switch, door lock actuators of all doors are unlocked. With the door key inserted in the door key cylinder on driver side, turning it to вЂњLOCKвЂќ, will lock door lock actuator of all doors. Selective unlock operation mode can be changed using вЂњDOOR LOCK-UNLOCK SETвЂќ mode in вЂњWORK SUPPORTвЂќ. Refer to BCS-87, "DOOR LOCK : CONSULT Function (BCM - DOOR LOCK)". The automatic door locks function is the function that locks all doors linked with the vehicle speed or shift position. All doors are locked when the vehicle speed reaches 24 km/h (15 MPH) or more. BCM outputs the lock signal to all door lock actuators when it detects that the ignition switch is turned ON, all doors are closed and the vehicle speed received from the combination meter via CAN communication becomes 24 km/h (15 MPH) or more. If a door is opened and closed at any time during one ignition cycle (OFF → ON), even after initial auto door lock operation has taken place, the BCM will relock all doors when the vehicle speed reaches 24 km/h (15 MPH) or more again. The LOCK operation setting of the automatic door locks function can be changed. The ON/OFF switching of the automatic door locks (LOCK) function and the type selection of the automatic door locks (LOCK) function can be performed at the WORK SUPPORT setting of CONSULT. Refer to BCS-87, "DOOR LOCK : CONSULT Function (BCM - DOOR LOCK)". The automatic door locks (LOCK) function can be switched ON/OFF by performing the following operation. Press and hold the door lock and unlock switch for 5 seconds or more in the lock direction within 20 seconds after turning the ignition switch ON. The switching is completed when the hazard lamp blinks. 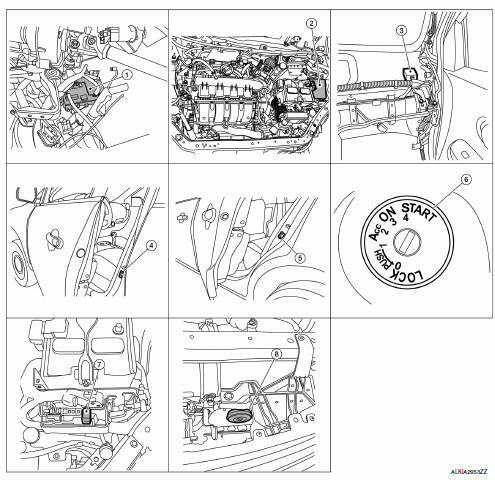 The ignition switch must be turned OFF and ON again between each setting change. The automatic door locks (UNLOCK) function is the function that unlocks all doors linked with the key position or shift position. All doors are unlocked when the power supply position is changed from ON to OFF. BCM outputs the unlock signal to all door lock actuators when it detects that the power supply position is changed from ignition switch ON to OFF. The UNLOCK operation setting of the automatic door locks function can be changed. The ON/OFF switching of the automatic door locks (UNLOCK) function and the type selection of the automatic door locks (UNLOCK) function can be performed at the WORK SUPPORT setting of CONSULT. Refer to BCS- 87, "DOOR LOCK : CONSULT Function (BCM - DOOR LOCK)". The automatic door locks (UNLOCK) function can be switched ON/OFF by performing the following operation. Press and hold the door lock and unlock switch for 5 seconds or more in the unlock direction within 20 seconds after turning the power supply position ON. *1: This function is set to ON before delivery. Interlocked with the locking operation of door lock and unlock switch, door lock actuators of all door lock actuators are locked. Interlocked with the unlocking operation of door lock and unlock switch, door lock actuators of all door lock actuators are unlocked. Interlocked with the locking operation of door key cylinder, door lock actuators of all door lock actuators are locked. When door key cylinder is unlocked, door lock actuator driver side is unlocked. When door key cylinder is unlocked for the second time within 5 seconds after the first operation, door lock actuators on all doors are unlocked. Select unlock operation mode can be changed using DOOR LOCK-UNLOCK SET mode in вЂњWORK SUPPORTвЂќ. The remote keyless entry system can be locked and unlocked by pressing door lock and unlock button of keyfob. When door lock and unlock button of keyfob is pressed, door lock and unlock signal transmits from keyfob to BCM via remote keyless entry receiver. When BCM receives the door lock and unlock signal, it operates door lock actuator, flashes the hazard lamp (lock: 2 times, unlock: 1 time) and horn chirp signal to IPDM E/R at the same time as a reminder. IPDM E/R honks horn (lock: 1 time) as a reminder. Lock/unlock Key switch is OFF. Mechanical key is removed from the ignition cylinder. To ensure that the keyfob works effectively, use within 10 m (33ft) range of the vehicle, however the operable range may differ according to surroundings. When door lock is unlocked, pressing LOCK button on keyfob once will lock all doors. When door lock is locked, pressing UNLOCK button on keyfob will unlock driver side door. Pressing UNLOCK button on keyfob second time within 5 seconds from the first time will unlock all doors. When the doors are locked or unlocked by keyfob, power is supplied to sound horn and flash hazard warning lamps as a reminder The hazard and horn reminder has C mode (horn chirp mode) and S mode (non-horn chirp mode). Hazard and horn reminders can be changed using "WORK SUPPORT" mode in "MULTI REMOTE ENT". Hazard and horn reminders do not operate if any door switch is ON (any door is OPEN). Hazard reminder can be changed using вЂњHAZARD LAMP SETвЂќ mode in вЂњWORK SUPPORTвЂќ. Horn reminder can be changed using вЂњHORN CHIRP SETвЂќ mode in вЂњWORK SUPPORTвЂќ. Refer to BCS-89, "MULTI REMOTE ENT : CONSULT Function (BCM - MULTI REMOTE ENT)". Refer to OwnerвЂ™s Manual for instructions. Auto door lock mode can be changed by вЂњAUTO LOCK SETвЂќ mode in вЂњWORK SUPPORTвЂќ. Refer to BCS-89, "MULTI REMOTE ENT : CONSULT Function (BCM - MULTI REMOTE ENT)". When key switch is OFF (mechanical key is removed from the ignition cylinder), BCM turns ON and OFF horn and headlamp intermittently with input of PANIC ALARM signal from keyfob. BCM outputs to headlamps and IPDM E/R for panic alarm signal (horn signal) via CAN communication lines. The alarm automatically turns OFF after 25 seconds or when BCM receives any signal from keyfob. Panic alarm operation mode can be changed using вЂњPANIC ALARM SETвЂќ mode in вЂњWORK SUPPORTвЂќ. 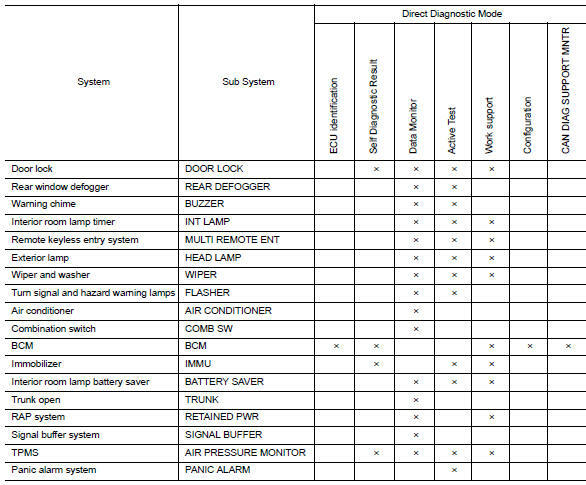 When the following conditions occur, remote keyless entry system turns on interior lamp for 15 seconds with input of UNLOCK signal from keyfob. For detailed description, refer to DLK-216, "POWER DOOR LOCK SYSTEM : System Description". Door switch OFF (when all the doors are closed). 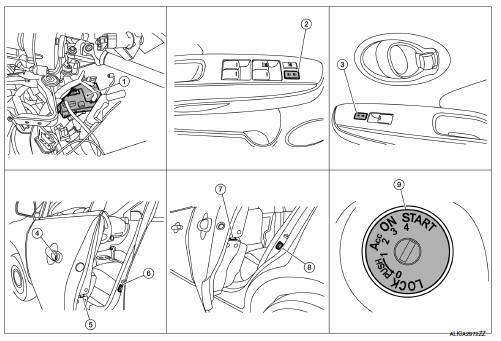 When trunk lid opener switch is ON, BCM operates trunk lid opener actuator. If the following conditions are satisfied, trunk open operation is performed.